Today author Philip Caveney stops by and takes part in my Inspired By feature. A boy wakes up on a train to Edinburgh. He is shocked to discover that no idea who he is or how he came to be on the train – and once off it, he finds himself immersed in the chaos of the Edinburgh Fringe. After a day of wandering the crowded streets, he falls asleep and is woken by the sound of bells tolling midnight – only to discover that is the night of The Calling – a magical yearly event when all the statues of the city come alive. He is the only human ever to witness it. He quickly makes a couple of allies – the Colonel, the bronze cavalryman of the Scots Grey’s monument, and the intrepid explorer David Livingstone. They christen the boy ‘Ed Fest’ and take him to Parliament Square to meet Charles II, the king of the statues, who isn’t particularly fond of ‘Softies’ (humans). He assigns Sherlock Holmes to investigate the boy’s case, to discover his real identity and to get back to his home and family. But as the bronze detective begins to decipher the clues, he discovers that ‘Ed’ is on the run from a sequence of terrible events; ones that could threaten his very existence. 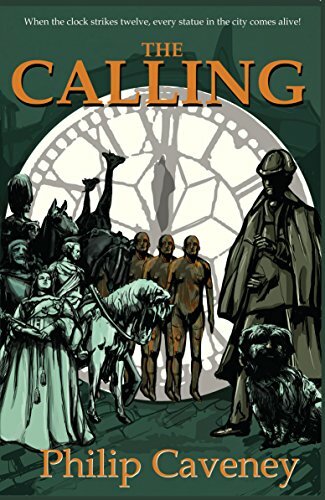 The Calling is a magical story set during Edinburgh’s most exciting event – and nearly all of its characters can be observed, standing on plinths in the heart of the city, waiting for next year’s Calling. Available now in our Love Books Group Bookshop – click here. Philip Caveney’s first novel, The Sins of Rachel Ellis was published in 1977. He went on to publish another eight thrillers before turning his hand to writing for younger readers with Sebastian Darke: Prince of Fools in 2007. The book was shortlisted for the Waterstones’ Prize and has been published all around the world. In 2012 Night on Terror Island won the Brilliant Books Award and in 2016, his novel, The Piper (written as Danny Weston) won the Scottish Children’s Book award. Philip’s much-loved trilogy, based in Edinburgh, features time-travelling young hero Tom Afflick and comprises Crow Boy, Seventeen Coffins and One For Sorrow. In 2018, The Haunting of Jessop Rise was shortlisted for the Scottish Teenage Book Prize. In November 2019, he will release The Sins of Allie Lawrence. I decided when I was a teenager that I wanted to be a writer. From the age of eleven, I was based in a rather horrible boarding school in East Anglia. It was a brutal place, where the pupils were regularly beaten for minor indiscretions and bullying was rife. My regular escape was to go to the school library and lose myself in a good book. One day, when I was perhaps thirteen years old, I picked up a copy of Something Wicked This Way Comes by Ray Bradbury and was riveted from the very first page. Something in the story spoke directly to me and convinced me that I had what it took to become a writer. I started pretty much straight away, creating short stories and reading them by torchlight to my captive audience – the other boys in the dormitory! I never considered giving up. It took me around ten years but eventually, in 1977, my first book was published. When it was finally in print, I wrote to Ray Bradbury, to thank him for inspiring me. I still have the warm and welcoming letter he wrote back. Ray died in 2012, but as long as his work is still in print, he’ll live on. Perhaps that’s what writing is really about. A quest for immortality. Be persistent. There will be hundreds of people, virtually queuing up to tell you that you can’t become a writer, that you don’t have the necessary talent and there’s too much competition, but you have to ignore them and keep going at it. The awful truth is you need to write an entire novel in order to learn how to write a novel. Chances are, the first one you create will be unpublishable, and if it is, well, just write another one. And another. And keep writing them until finally, one day, a publisher tells you they will put your work into print. And this is very important. They must pay you. If they ask you to pay them, then something is very wrong. If that happens, look elsewhere. It means that I get to work at a job I love. It may not be the best paid job in history, it pay not bring me riches and incredible luxury, but so many people have to spend their entire lives working at something they hate doing. Finally, do you have a favourite bookish quote? This, of course, is the opening line of Something Wicked This Way Comes and it is absolutely loaded with drama. It raises so many questions. Why does the salesman arrive then? How does he know a storm is coming? Is there any danger in carrying lightning rods in a storm? And what does he hope to achieve by such a reckless act? And then comes the next paragraph. Thank you ever so much, Philip, for being on the blog today. I will be reading my first book by Philip Caveney later this week! Great interview!